This is part one of three in a series about the upcoming The Art of Tiki show in Los Angeles at La Luz de Jesus gallery. The show is a celebration of the 21 years that have elapsed since the first Art of Tiki show at La Luz, back in 1996. The show opens on Friday, October 6, 2017, and runs through October 29. When I first saw the art for this show on the La Luz de Jesus website, I lamented that I would miss it, then realized I cannot miss it, and scrambled to make arrangements to for a trip to Los Angeles. I’ll be taking a few days to bop around, most importantly at the show’s opening night party, which starts at 8pm on Oct 6. Naturally I’ll be paying some visits to nearby Tiki-Ti! Joining me for my grand Los Angeles tiki adventure: Christie White (of Tiki Kiliki Productions, you know her best as the co-founder and the former, longtime organizer of The Hukilau) and Pam Kueber of Retro Renovation. I’m kinda completely giddy about this trip. Critiki: How many artists are participating in the show? Otto: Thirty artists in the book, 33 in the gallery show. The deadline for the catalog was five months before the show, so some artists were unable to create a new piece before the catalog deadline. 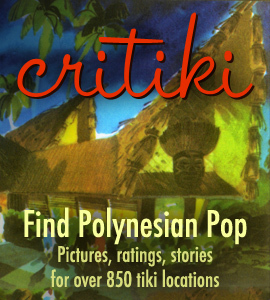 Critiki: What is exciting you today about tiki art? Otto: That some artists are able to make a living doing Tiki art. In 1995 Bosko asked that question: “Would any artist be able to make a living making Tiki art the way Eli Hedley, Oceanic Arts and dozens of others had in the heyday?” And now it is a reality. Critiki: How has your own excitement about tiki art shifted since the first show 21 years ago? Otto: It’s incredible to imagine that a gallery exhibit of Tiki art could be successful, and then to make it happen, and then to see it grow across the country and the world. It’s like the Little Engine That Could. On the other hand, while I can never create the excitement of “the first time,” you might be surprised to find that I am genuinely excited about Tiki art today. I am always amazed at new creations and innovations within the Tiki Style that creative artists continue to come up with. Critiki: How was it different pulling together this show, vs. 21 years ago? Otto: It was much more challenging to put together a show now than in the beginning in 1996. Back then we just grabbed every artist that ever put a Tiki in their art. Then we tried to fit them all into one show! Now there are so many artists to choose from. The Tiki Style has taken hold internationally and there are artists around the world doing top notch art. It was very challenging to try to choose one artist over another. We also put a limitation on the number of pieces in order to not crowd the show and hang it salon style and thereby make it look less professional or cheaper. We wanted to keep it as high brow and within the realm of a gallery show. It is harder to put together than it would seem. Critiki: What are some of the pieces you’re most excited about? Otto: I’m excited to be able to include some artists from the original show like Von Franco, Shag, Crazy Al, Jeffrey Vallance, Mary Fleener. Artists from around the world include Bai (France), Danielle (Australia), Mookie (Japan), Dr. Alderete (Mexico). There are emerging artists, that I hope will continue to grow and I hope this show will buoy their careers. There are artists that are staples of the Tiki scene, that I have worked with a lot in the past through the Tiki Art Now series and Tiki Oasis, and I am happy to be able to present their art to the world. It would be impossible for me to pick one piece but I would like to point out that the show includes a piece by Brad “Tiki Shark” Parker and “Thor” Thordarson, both of whom do a limited amount of shows and create intricate, detailed, excellently executed paintings. Brad’s pieces sell out at every show and Thor pieces are also very rarely for sale. It is nice to have Dale Sizer in the show. He is one of the original artists who attended Sven’s salons in the early 1990s. It is nice to have Michael Uhlenkott and Jeffrey Vallance who were part of the “Second Wave” of the Tiki movement in the 1980s. It is nice to be able to include artists who are little known in the Tiki scene like Mike Hoffman. He is very famous in the fantasy comic world but I know him because he released a soundtrack album of Exotica and painted a Tiki painting with an exotic maiden for the cover art. And Rick Rietveld who is huge in the Surf Art scene but has only dabbled in Tiki art. Critiki: Anything else you would like to say about the show? Otto: It is important to note that the show is a concept. On my part it is an attempt to prove that the Tiki Art scene is healthy and successful and still on an upward trajectory. Therefore I had to include some of the original artists and some new artists. With the vast number of artists out there it is inevitable that many artist are left out—not because they are not good, but just because there simply is not enough space on the walls and in the book. The catalog is not a catalog of a show, it is a document of Tiki Art in general. It is an essay by Sven about Tiki art; it is a exhibit of new art; it is an exhibit of original Tiki artifacts. I’ve included some of the artwork here, and you can see almost all of the artwork on the La Luz website. See the show in person—and buy the art—at La Luz de Jesus gallery, 4633 Hollywood Blvd, Los Angeles. Read about Jordan Reichek’s collection of historic Polynesian Pop pieces for sale at the show, and get a sneak peek at Sven Kirsten’s latest book, which is part art history, part art catalog.